Trainer Tina Judge-Boyle with husband Mark Boyle celebrating another championship with Kesley Taylor and Zelda. Photo by Andrew Ryback. 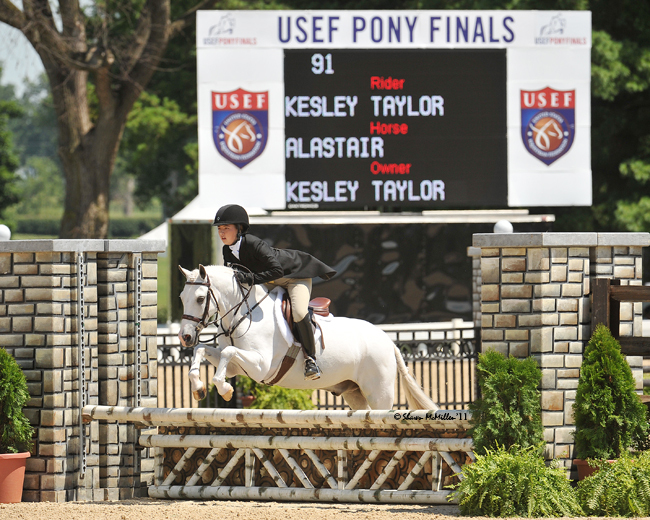 Oswego, IL - May 8, 2015 – Since Judgement Farm rider Kesley Taylor and her mount Zelda teamed up in August of 2014, the duo has been taking the High Children’s Jumper Division by storm. The pair has already won the Marshall & Sterling Classic four times, the NAL Classic four times, the WIHS Classic four times and has six division championships already under their belt. The successful team is currently leading the division in Zone 5. Kesley Taylor at Pony Finals in 2011. Photo by Shaun McMillen. 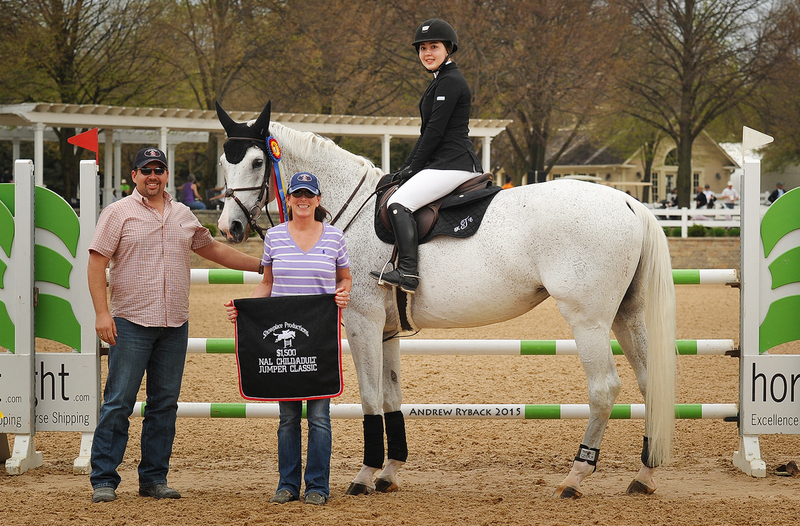 Taylor, 17, of Naperville, IL, started riding at Judgement Farm when she was just nine-years-old. She jumped for the first time in a lesson back then and the rest is history. When trainer Tina Judge-Boyle took her to her first show for the Short Stirrup Division, Taylor took the Championship and her love of horses and showing took off from there. Taylor, a junior at Neuqua Valley High School, rides six days a week and still has her first pony, Alastair that she rides as well. Her winning jumper, Zelda, is an older Warmblood that Taylor has bonded with. "I love the way she always listens to me and even if I don't make the best decision, she will trust me no matter what. She also loves to run as fast as she can after the last jump through the timers, which is a blast!" Kelsey Taylor and Zelda are currently leading in Zone 5 in the Children's Jumpers Photo by Andrew Ryback. Taylor is eager to ride any extra horses Judge-Boyle has on the exercise list and is always trying to learn more. The Judgement Farm program obviously works for Taylor. Taylor has her sights set on qualifying for the indoor finals and the North Region Children’s Adult Jumper Championships, which will take place at Lamplight Equestrian Center in September during the Showplace Championship Horse Show. Judgement Farm is a full service hunter/jumper training facility providing lessons, sales, training and showing. Trainer Tina Judge-Boyle has a great riding and training resume. She rode Shannon Kelly's Trust Me to numerous championships in the hunter divisions and rode in the USHJA International Hunter Derby Finals. Judge-Boyle has also ridden Grand Prix horses Buoyancy and Money, to top ribbons in Grand Prix competition. She has trained students to Illinois Hunter Jumper Association championships as well as the Pennsylvania National Horse Show, the National Horse Show, the Washington International, Pony Finals and Emerging Athletes Finals. She is assisted by Lori Hollands, who has partnered with Judgement Farm since 2000. For a complete list of services, visit their website at www.judgementfarms.com or contact the farm at 630-554-6760. Watch for more news on Judgement Farm riders and “Like” their Facebook page at Judgement Farm.